The Heritage Flight is the next Earth Orbit Service and will launch from historic Kennedy Space Center. A mission of purpose, a dream fulfilled. Witness the power and grandeur of a launch into space. Read about the participants aboard the Heritage Flight. 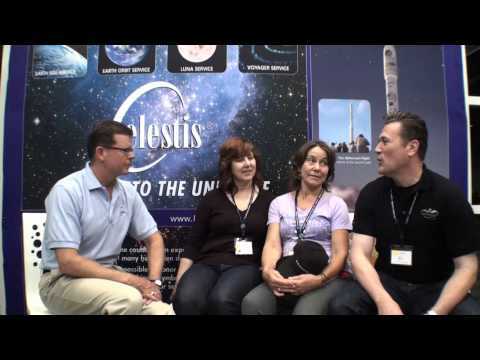 Hear first hand impressions from Celestis launch guests. Personal flight capsule launched to Earth orbit aboard a commercial rocket. Includes a pre launch tour of the Kennedy Space Center launch site, memorial service attendance, and much more. Unable to travel to see the launch? No problem. Watch the memorial service and the launch live, via webcast. *Launch dates are subject to change. Stay informed about the mission schedule, important event details, live launch broadcast and more. For someone who always loved space, longed to journey among the stars, or simply found peace and tranquility in the evening sky, orbiting Earth aboard a Celestis spacecraft is a truly befitting way to celebrate and remember a life. Join families from around the world at Kennedy Space Center, Florida for the ultimate mission of purpose – the Celestis Heritage Flight. 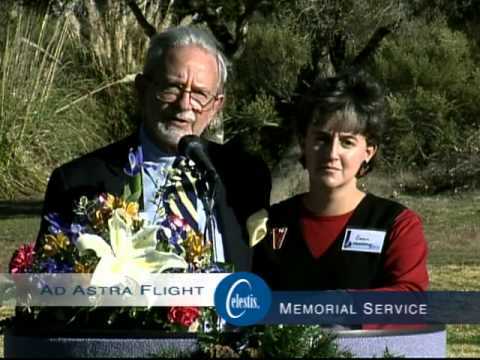 Celestis memorial space launches bring together people from all over the world for a compelling memorial service. The chance to share stories about a loved one on board, to make new friends, and to witness – often for the first time – the power and grandeur of a launch into space is an experience you will cherish for years. These special memories and lifelong connections offer a great comfort for many during a time of loss. Attend the Heritage Flight memorial service, an event that brings together people from all over the world who share thoughts and remembrances of the loved ones on board. "Three, two, one, we have liftoff!" Experience the power and emotion of liftoff as the rocket launches, carrying your loved one aboard. The Heritage Flight will be hosted aboard the Orbital Test Bed (OTB) satellite, now undergoing final construction and testing at the General Atomics (formerly Surrey Satellite US) facility in Englewood, Colorado. OTB will orbit the Earth for 25 years and may be tracked on this website, joining two other Celestis spacecraft currently orbiting the planet. Celestis and General Atomics staff next to OTB after completing Flight Capsule Payload Integration I. Vessel containing Celestis Flight Capsules attached to OTB designated by red arrows. A Surrey engineer integrates Heritage Flight participant capsules and modules to the vessel that will carry them on the OTB. Closeup of Celestis capsules and modules in the device integrated into the OTB. Engineer working on OTB spacecraft. Marj Krueger — "Jayge Carr"
"I cannot express how thrilled my family is about the launch. It is truly a wonderful day. We watched from our homes but we celebrated with the entire Celestis and New Frontier family. Thank you, a million times over, for this opportunity. This was the only idea about which Dad showed any enthusiasm as we talked with him about his memorial service - and oh, the enthusiasm he had for this." "I just received the DVD of the New Frontier Flight. It was beautiful and brought me to tears! Not only was the first part of the launch at night beautiful but the dedication to all the 'astronauts' that took their final voyage was inspiring! So many wonderful sendoffs for so many different people from all walks of life. I felt like I was actually there with everyone. Just beautiful!" "Thank you so much for helping us fulfill my husband Michael's dream of spaceflight! I couldn't think of a more fitting send-off!" "It's an incredibly rewarding experiernce we'll take with us for the rest of our lives." "Made a difficult and trying experience, a delight, a rejoicing..."
Every Celestis mission has its own logo and mission patch, following the tradition of creating a unique identity for each launch dating to the earliest days of the American space program. The Heritage Flight logo – with fourteen stars recognizing the 14 previous Celestis missions - commemorates the lives of those on board the flight and pays tribute to all the men and women in Colorado, California, Texas and Florida who have worked so hard to bring about this historic, Earth orbit mission. A special marker honors Houston – home of Celestis, Inc. The Heritage Flight logo is from well-known designer and illustrator Eric Gignac. Eric’s portfolio also includes co-design of NASA Space Shuttle mission patches for the STS 128 and 133 missions.